Do you know any differences between Safari for Intel Mac and for PowerPC? But Safari for PowerPC and other browsers are never crased. this button works on Safari for Intel Mac. this button works as well. this button crashes Safari for Intel Mac. 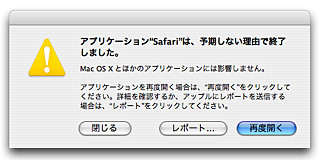 However, it's too violent behavior of Safari to make itself crashed, isn't it?